High Quality Content by WIKIPEDIA articles! 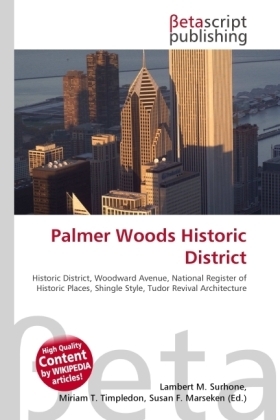 The Palmer Woods Historic District is a residential historic district bounded by Seven Mile Road, Woodward Avenue, and Strathcona Drive in Detroit, Michigan. There are approximately 289 homes in the 188-acre (0.76 km2) district. It was listed on the National Register of Historic Places in 1983. The Palmer Woods Historic District is named after Thomas W. Palmer, a prominent citizen of nineteenth-century Detroit and a United States Senator. Palmer's estate included land on both sides of Woodward Avenue, stretching from Six Mile Road to Eight Mile Road. During his lifetime, Palmer donated some of his land to the city of Detroit to establish Palmer Park, and gave additional land to the state of Michigan to build the Michigan State Fairgrounds.